China’s willingness to adopt emissions targets reflects its confidence in non-fossil energy. President Obama was supposed to be focusing on trade during his trip to Asia this week. No one expected him to pull off a landmark climate deal. 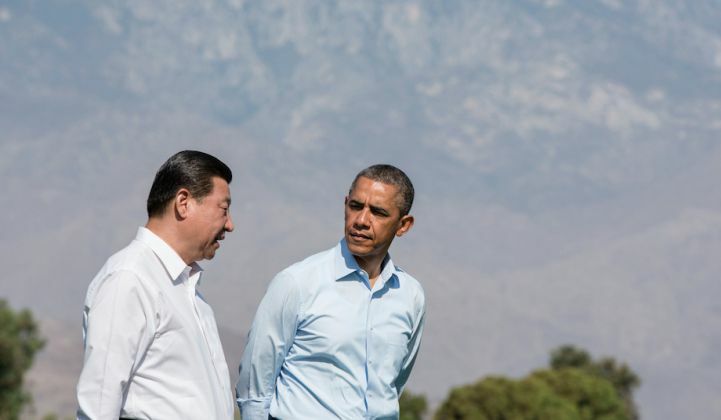 After nine months of talks, the White House announced this morning that the U.S. and China had agreed to historic joint targets for reducing carbon dioxide emissions. While the targets are not binding, the negotiations represent the first time China has agreed to a cap on carbon dioxide levels. Administration officials say the targets will create meaningful momentum as America tries to negotiate an emissions treaty with large developing countries in 2015. The agreement is a reflection of the international pressure on China to address its growing emissions, as well as China's own confidence in clean energy to help power its growing economy. "President Xi Jinping is finally demonstrating to the rest of the world that his country is willing to step up and play a leadership role on this issue," said Melanie Hart, the director of China policy at the Center for American Progress. "We are still expecting even more from China in the run-up to the Paris negotiations." China, now the most carbon-intensive country in the world, says it will peak emissions by around 2030 "with an intention to peak early," and set a goal of getting 20 percent of its primary energy from renewables and nuclear by 2020. The country already has a target of 15 percent renewables by 2020, so the new one is not a dramatic departure from existing policy. However, rising energy consumption in China will require it to install 800 to 1,000 gigawatts of nuclear, solar, wind, hydro and other sources over the next fifteen years, according to White House officials. Still, some were skeptical: "Given the huge growth in renewables, it should be higher," Tao Wang, a Chinese climate scholar, told Reuters. America, which already had a voluntary commitment to reduce emissions 17 percent by 2020, will speed up reductions by between 1.2 percent and 2.8 percent from now until 2025. The Obama administration wants to drop carbon emissions by 26 percent to 28 percent by 2025 with no new regulations, using 2005 levels as the baseline. "This ambitious target is grounded in intensive analysis of cost-effective carbon pollution reductions achievable under existing law," wrote the White House in a release. However, that target is based on rolling out EPA regulations that allow states to create flexible emission reduction plans. With fewer allies in state government after the Republican takeover in last week's elections, it's unclear whether the Obama administration will get the traction it needs to increase targets. There are other reasons for caution. While important, China's proposed peak in 2030 is not terribly ambitious. It is well past the time when scientists say global emissions need to decrease. And because the targets are not official, they don't necessarily mean that a binding treaty will be reached at the United Nations climate summit in 2015. But the agreement is the clearest sign yet that the Chinese government sees a future beyond coal. It also shows how far clean energy has come as an influential factor in negotiations. "The non-fossil commitment may be the most important piece of the puzzle," said CAP's Melanie Hart. "The amount of renewable and nuclear energy China will have to deploy by 2030 to hit that target is absolutely breathtaking. It will require Chinese leaders to set even harder limits on coal." China already has plans to get 50 gigawatts of nuclear, 70 gigawatts of solar, 150 gigawatts of wind and 330 gigawatts of hydro installed in the next few years. The new target, while not groundbreaking, would open up the opportunity for China to support nearly a terawatt of additional nuclear and renewable energy capacity. Seven years ago, when China became the world's biggest emitter of carbon dioxide, there were few signs that the country would slow its rate of coal-burning. The country is still by far the world's largest user of coal, accounting for roughly 50 percent of global consumption. But a confluence of factors has shifted China's outlook on coal. Domestic backlash against air pollution, growing water scarcity problems, international political pressure and the competitiveness of renewables have all come together to make China more willing to wean itself off coal. In August, China's coal consumption dropped for the first time in a decade. Some analysts believe Chinese demand for coal could peak this year, though the International Energy Agency says the peak will come closer to 2019. Coal will still be a core piece of China's growing economy, but the country's leaders are becoming increasingly bullish on non-fossil energy every year. "You can bet China's coal sector is already starting to sweat," said Hart. The agreement would also create more cooperation between China and the U.S. on clean energy trade issues -- a track that China sorely needs to pursue after its domestic solar producers were slapped with large tariffs for uncompetitive business practices supported by the government.